Talk politics. Meet folks. Share seeds. Panel lectures on the history and politics of seed saving. Featuring Ken Greene, founder of the Hudson Valley Seed Library, and more! Interactive discussions to follow panel. 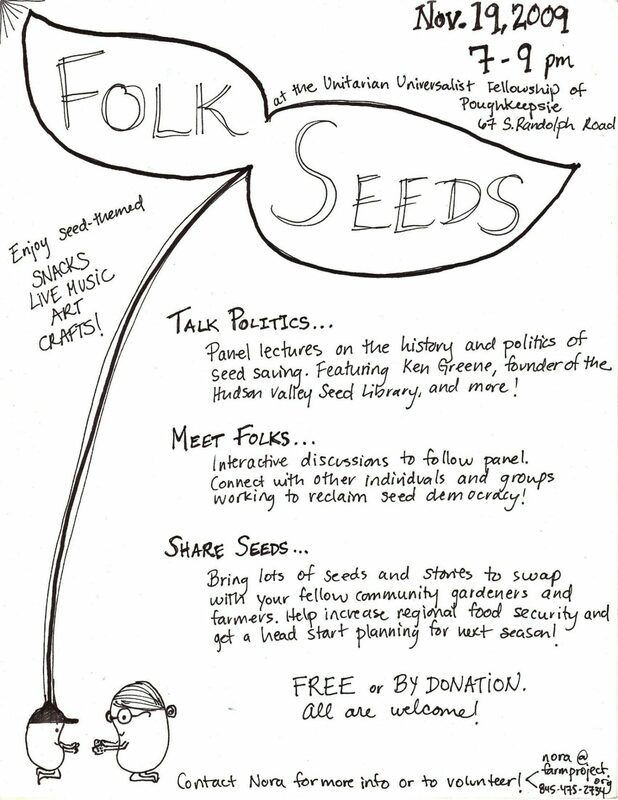 Connect with others individuals and groups working to reclaim seed democracy! Bring lots of seeds and stories to swap with your fellow community gardeners and farmers. Help increase regional food security and get a head start planning for next season! Enjoy seed themed SNACKS, LIVE MUSIC, ART, AND CRAFTS! At the Unitarian Universalist Fellowship of Poughkeepsie, 67 South Randolph Avenue, Poughkeepsie NY. Admission is free or by donation. All are welcome.